A few weeks after visiting the "Steve Jobs" production office, I got to watch some actual filming. The Mac was introduced at Flint Center in Cupertino in 1984. In the movie, Flint Center got to play itself. The place was nicely dressed up for the occasion. The crew needed 2500 people to come sit in the auditorium for hours, and they weren't sure how many would show up. But it turned out that thousands of people stood in long lines to get in, and some had to be turned away because there was no room, just like at the original event. There were actual non-actor security guards at the doors, but they let me in without an argument - much different security than an actual Apple event would have. 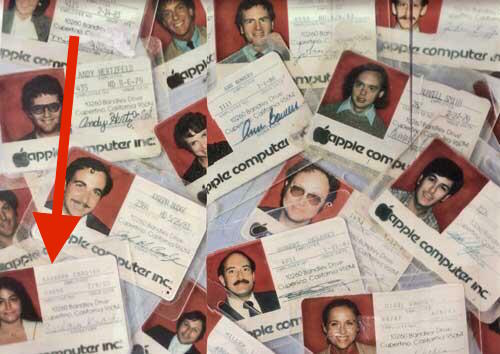 There were actors dressed in '80s clothes and wearing fake old-fashioned Apple employee badges. 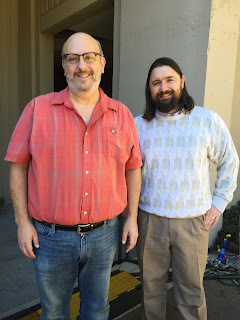 I met the guy playing Mac software engineer Steve Capps, who wasn't wearing what Capps would wear. Nerd on left, actor on right. This movie had a code name. I ran into Danny Boyle, the director, who I talked to on my first visit. He was very busy, but took a few minutes to chat. He remembered my story about how I was recruited by Steve at NeXT. He said he told Michael Fassbender that story as an example of how Steve never gave up and ended up getting something from me anyway. An actor I saw backstage asked me if I was Andy Hertzfeld. As filming began, they shot this scene from act 1 many times, with the actors trying different things each time. I was watching on a giant monitor with some of the crew. This was weird. It felt like I was watching actors play people I know in real life - which is exactly what was happening. Here's a super-blurry photo taken while filming an outdoor scene of Jobs and Woz as they walked and talked, Sorkin style, outside Flint Center under the giant trees. Master Mac historian Tom Frikker got this wonderful souvenir. And when I left for the day, I got this parking ticket. Which made me think: WWSJD? Last January the Steve Jobs movie came to town and called me up. I was leaving work one day when I got a phone call from a guy named Todd Marks. He said he was on the crew of a new movie about Steve Jobs. He said they're filming a scene that’s the public intro of the Mac in 1984. They heard I was there at the original event, and they wanted to talk to me about what was going on that day. Cool! I said sure, I’d come by. Actually, I knew about this movie already. Aaron Sorkin wrote the screenplay. Danny Boyle was directing it. So it sounded like a big-time movie. I went to the address they gave me in San Francisco. It was some crappy two-story building way out near pier 80. Let’s just say it didn’t look like the office of a big-time Hollywood movie. But I went to the door and there was Todd. Inside, suddenly, it was movie world. Lots of LA-looking people running around. I felt like I found a secret S.H.I.E.L.D. base. Every office in the building was for a different department in the movie. Set design, wardrobe, props, visual effects, art, and more. Todd was incredibly nice as he showed me around from office to office. It was like a maze. Every room had things taped up on the walls. Giant blown up pictures of the different events they were going to re-create. One entire wall was nothing but ancient Mac error messages. Another was photos of buildings where different Apple events happened. One wall had pictures from the Internet of random Apple employees from the '80s. I saw one picture that looked familiar, walked up to it, pointed at it and said "That's my wife". In Wardrobe, they showed me a couple of Apple shirts and asked me to “clear” them for use in the 1984 scene. There was a polo shirt with the Apple logo that I said looked right, and another shirt with “Macintosh: the power to crush the other kids” (too soon for that one, I said). In every department they asked me questions about the original Mac intro event. Were people dressed up, or casual? How old were they? Did they bring briefcases? Did they drive, walk, bike to the event? How did the Apple employees wear their badges? What did it look like backstage? Which computers did they use to run the event? Were there tickets? Just everything. Everybody was friendly. They treated me like a VIP. I told old stories and they actually seemed interested! As I toured around I noticed everybody had a copy of the script on their desks. Every copy had the name of the person it belonged to printed on the front. They told me it was top secret and I couldn’t look at it, so of course I really wanted to look at it. When I saw an open script I tried to read something from it (upside down), but all I could see was something about Dan Rather. I don’t know if that made it into the movie. They wanted to re-create the original Mac intro event in great detail. But they also said "it's not a documentary". Not everything in the movie would be true to the way it really happened. They have a story to tell. But they were going to be accurate wherever possible about the visuals and the technology. That’s why they called people like me. Pretty much everybody working on the Steve Jobs movie had iPhones and Macs. After talking to all the different departments, Todd said the director wanted to meet me. Cool! That would be Danny Boyle, who has a pretty great resumé including a Best Director Oscar for Slumdog Millionaire. So Danny Boyle came by. I figured he’d say hi and bye. But we talked for half an hour, and he was wonderfully friendly. He enthusiastically sold me on the movie. He said it’s not a blockbuster special effects movie. It’s about the mind of Steve Jobs, and there’s redemption in the end. About how Mac was the start of computers being friendly enough for regular people. It has a great Aaron Sorkin script. The studio wanted to film in Georgia because it’s cheaper, but he fought to make it in the Bay Area where it happened. 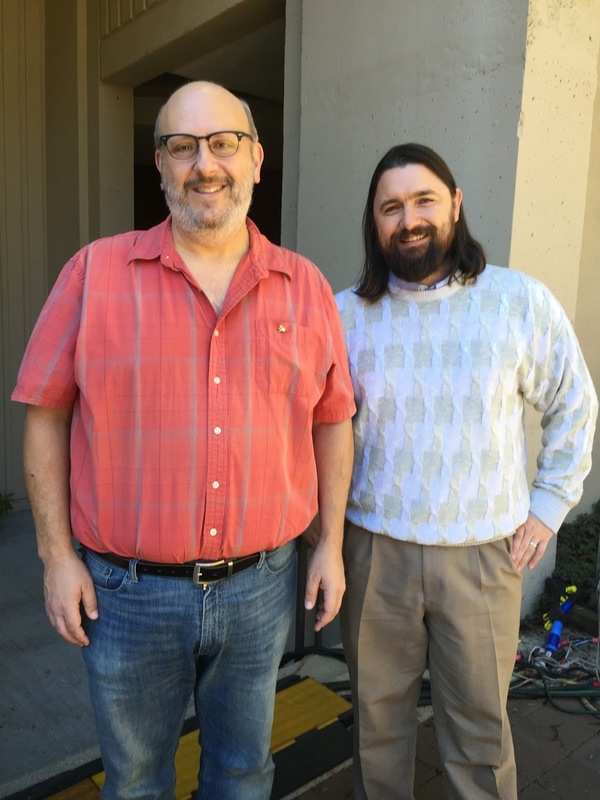 He invited me to come to the shoot in Cupertino that was happening a few weeks after. He was incredibly polite and gracious. I expected to spend 20 minutes or so talking to the movie people. I ended up spending 2 hours. It was surreal. 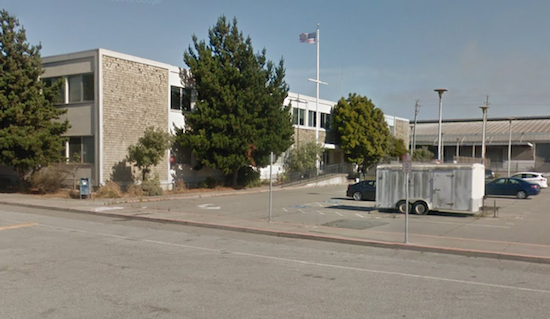 Think about it: I was summoned to a secret headquarters disguised as an ordinary building. Pictures from my past were printed out and blown up on walls, including a photo of my wife. People asked me about old events in great detail, and were very interested in the answers. And then at the end, I met the mastermind, and he turned out to be a nice guy. Then I left movie world and returned to ordinary San Francisco 2015.